This is used to multiply a factor to data in each axis. The "Multiply constant" window opens by clicking this button. 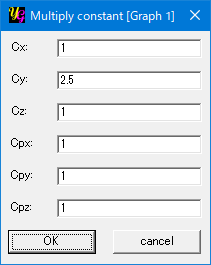 Then you enter constants for x-, y- and z-axes, respectively and click "OK". Use [expression] to carry out more complicated operations.